Puff the Magic Dragon would be at home at the Abba, a one-star hotel that advertises itself as a "smoker-friendly environment." 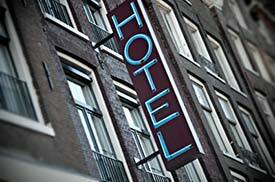 The hotel is close to the Vondelpark, within walking distance of the city center. All the singles and doubles are smoking rooms, if you get our drift. Breakfast includes fresh hemp rolls and muffins. The Prinsenhof is four minutes on foot from Rembrandtsplein. It occupies an 18th Century townhouse, and rooms with beamed ceilings accommodate one to four guests.